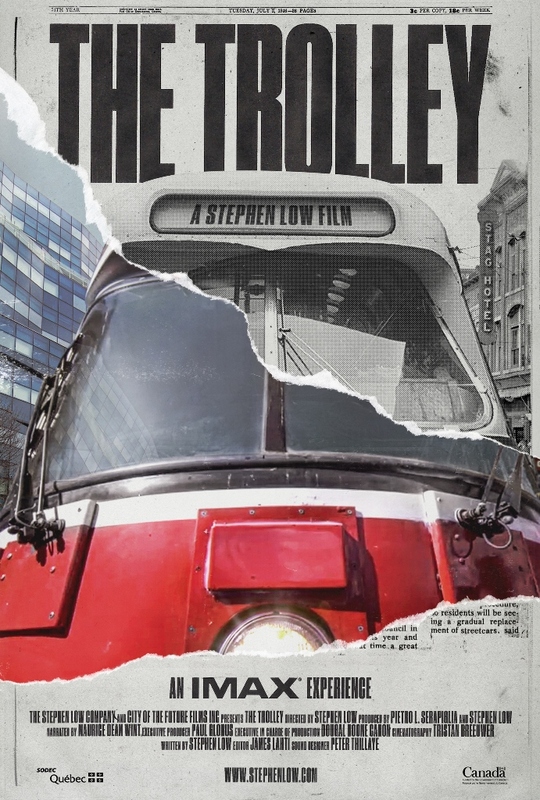 The Trolley, directed by Stephen Low, Canada, 2017. World Premiere at HotDocs, Cinesphere (Ontario Place), Saturday, May 5, 2018 at 3:00 pm. Free tickets available at the HotDocs Box Office while they last. A possible extended run has not yet been announced. An IMAX film about streetcars! A railfan’s dream movie! No longer need we catch glimpses of streetcars in exotic locales making ever so brief cameo appearances. Here is a whole documentary about streetcars and how they were, almost, the lost solution to many transit problems. If only it were that straightforward. We open on a sad streetcar boneyard, aged cars piled up for scrap and almost certainly beyond recall even by dedicated restorers. They are relics of an era when the streetcar ruled transit systems, when they were the backbone of transit throughout North America and Europe. A time when some cities would even have fake streetcar lines in souvenir postcards showing what modern, up-to-date towns they hoped to be. This film seeks to be both educational and a piece of transit advocacy showing how streetcars, or Light Rapid Transit as they are now called to disguise their plebeian past, could be the foundation for a transit renaissance. But The Trolley runs aground, so to speak, by jumping around in time and space without pursuing a single thread to its end. The first problem is that it is Toronto-centric, and a bit out of date at that. There is lots of footage of our older cars, but almost none of the new Flexitys thanks to the age of the filming. I kept waiting for an elegant shot of Spadina or Queens Quay filled with new cars, but instead saw only a few of the prototypes, including one inexplicably in a distinctly non-Toronto colour scheme. On the historical side, the film touches the expected high points of the rise and fall of streetcars from early electrification, the development of larger cars like the Peter Witts, the apex (at least for North America) of the PCC, and the decline as streetcars faced competition from subways, but far worse from the automobile which served growing suburbs beyond the reach of worn out systems. The change was helped along by the automotive industry, the subject of a Senate investigation back in the 1970s, but the damage had been done decades earlier. Certainly, subways have been promoted as a way to get streetcars out of the way of motorists, notably in Toronto, but major networks such as in London and New York co-existed with streetcars for decades. The first subway in North America, in Boston, was for streetcars, and it remains in use as part of the “Green Line”. As a long-time documentary viewer at cinemas and on television, there are certain basics I expect from this type of film, notably accuracy. One can advocate, but at least get the facts right, keep the timelines straight, and don’t claim causality where it does not exist. The film’s bouncing time sequence does not help, and we do not trace the streetcar through one arc from birth, through rise, to near disappearance and then renaissance. That, plus the Toronto focus, sets up a fundamental factual error. The Trolley implies that the streetcar renaissance began in North America and cites the Flexity as a recent example. In fact, Europe never completely lost its streetcars, despite widespread wartime damage and competition from automobiles. Surviving systems there modernized and showed what could be done both with vehicle design and the evolution of surface transit to provide higher capacity on protected rights-of-way without the cost of subways. Toronto’s first renaissance began in 1972 with the City’s decision, one in which I was deeply involved as a young transit advocate, to keep its streetcars. At the time, the opposition came from still-strong auto-oriented thinking and the unexpected appearance of a new technology touted by Queens Park as the “missing link” between subways and buses. The politicians and the boffins didn’t want to hear about streetcars or LRT or any suggestion that their pet project was, politely speaking, misguided. Indeed, the CLRV owes its existence to the demise of the provincial high-tech project and the desperate need of the then-government to produce something transit could actually use. A TTC design for new streetcars from the mid 1960s was dusted off and became, much changed, the CLRV. This episode is completely absent from The Trolley, and yet it shows the depth of official ignorance of what LRT could do. In fact, Toronto’s newest cars descend from European designs that have evolved over the decades independently of North American systems, and the LRT renaissance in North America owes its existence to off-the-shelf European cars. 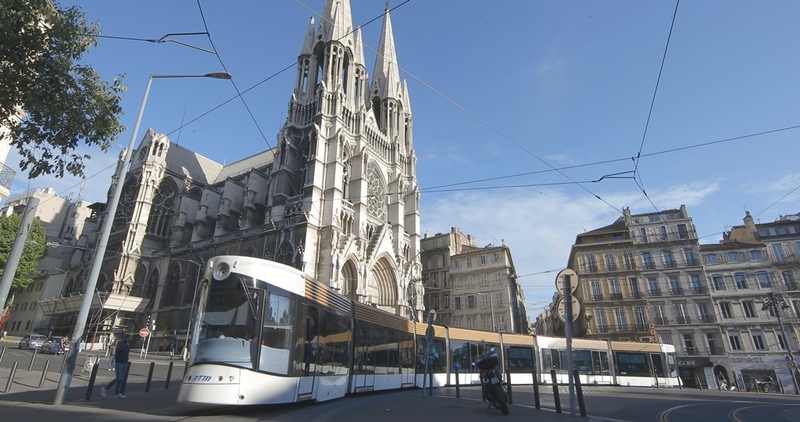 An articulated Flexity tram in Marseille, France. A few systems both in North America and in Europe kept some of their old cars (New Orleans and San Francisco are the best known on our side of the pond), but vintage cars can be found on systems like Lisbon’s and Milan’s. The latter’s Peter Witts date from the 1920s and about 100 (of the original 500) have, with much rebuilding, been kept alive and in regular service. But they are not the only cars in the fleet, contrary to the impression The Trolley might give. 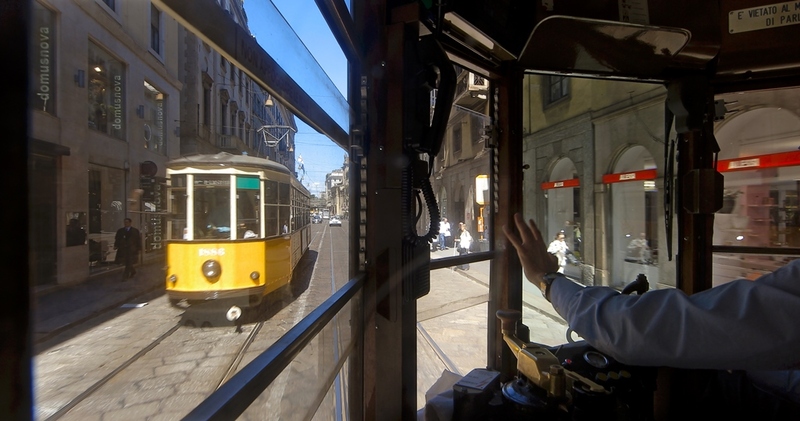 Classic yellow Peter Witt trolleys designed in the 1920s still serve in Milan. The strongest argument for LRT is the variety of uses this mode can see all the way from complete right-of-way segregation, including underground operation, to mixed traffic like a traditional streetcar. The fight is always over taking road space away from cars, a battle that is more successful in cities where public transit has an established presence. There certainly was a streetcar renaissance in North America, and Toronto’s 1972 decision started the process which saw new systems in Edmonton and Calgary, as well as San Diego. Other lines followed, although an attitude that “only streetcars mean your city is up-to-date” from a century before led to rather odd decisions about where some new lines were built. The Trolley ends with footage from the Easter Parade in The Beach a few years back, and plays the event as a celebration of the streetcar rather than the local parade it has always been. This, rather than a view of modern Toronto streetcars, is an odd place to end the story. Is The Trolley worth seeing? Yes, if only for the glory of views from many cities splashed in high-definition across an IMAX screen. However, as advocacy and education, The Trolley falls short thanks to bad research and a confused story line. Illustrations courtesy of The Trolley.